Your kiddo may be a little shy but he sure does have quite the roar. Your mini man reminds us of one of our favorite fictional characters from the wonderful Land of Oz. Grab this Cowardly Lion Costume for your youngling and maybe, just maybe, he’ll be lucky enough to get wrapped up in a grand adventure that will bring out his courage! Dorothy meets a lot of interesting residents of Oz while she journeyed along the yellow brick road. A brainless scarecrow, a tin man looking to be complete with a heart, and of course, everybody’s favorite king of the forest, the Cowardly Lion are the three characters that most often come to mind. These three represent what many of us are looking for along our journey in life, logic, love, and courage. You already know your youngster is full of love and is on his way to becoming one of the smartest people in the world, so why not help him come out of his shell with this lion costume. Once you slip him into this furry jumpsuit all of his shyness will melt away. Much like the lion at the end Dorothy’s story, your kiddo won’t be able to help himself from proudly roaring and running all around the neighborhood. 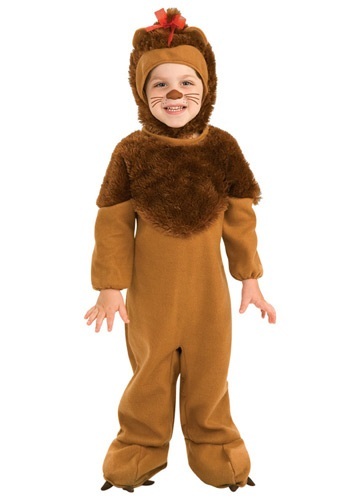 Grab this Cowardly Lion Costume for your little one and watch the smile grow on his face. Make sure to grab your camera so you can take plenty of pictures of your little lion before his wonderful adventure though Oz begins!